Summer and Emma are fortunate to have a lot of playmates at the condominium where we live. Many of them enjoy arts and crafts too, and once in a while, a handful of them would come over our unit to join me and my daughters work on some art projects. They always enjoy our afternoon craft sessions and I’m just as pleased to share with them the things my daughters and I love to do. Two Saturdays ago, I was even happier to be able to contribute to our community in a larger scale by fascilitating a three-hour art workshop exclusively for the children who live in the building. It was a summer project organized and sponsored by DMCI Communities for Accolade Place. Of course my mommy friends were happy to let their little ones take part in it and the children themselves were even more thrilled! Twenty-one energetic children from ages 2 to 11 joined us and we spent that morning designing and painting tote bags! I taught them how to mask and work with stencils, as well as come up with their own patterns. It was really fun to watch them go at it. I provided sticker masks for them to work with but they also made their own shapes and even cut out letters to form their names and personalize their bags. There was also an abundance of textile paint in bright summer colors for them to use. Combine all that with their playful designs and you’ve got a bunch of unique and cheerful looking tote bags! 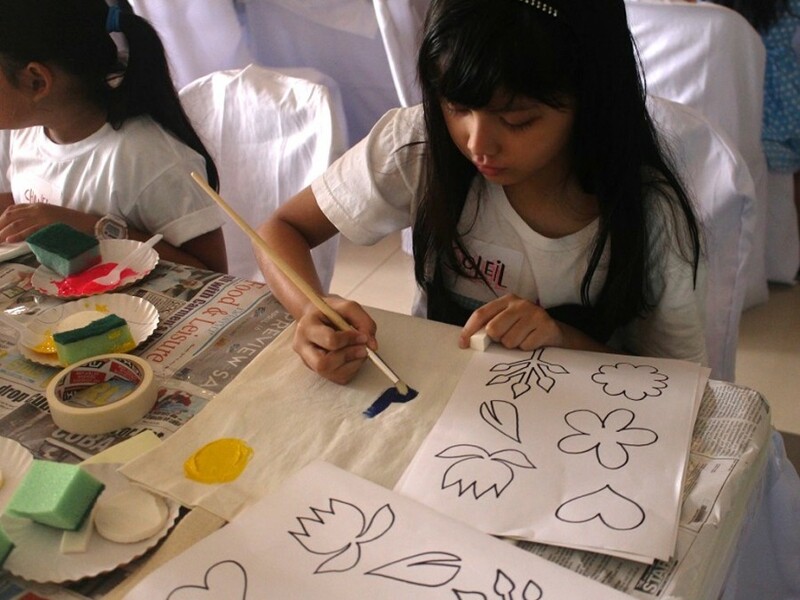 It was a simple art activity and yet everybody seemed to have had a great time, my little girls included. Aside from the art materials, DMCI also provided snacks and gifts to the children. It felt a little bit like Christmas! I’m thankful to DMCI for putting together this event. It was a good community-building activity and it was really great to see the children have fun making art together, even encouraging and helping out one another. Some of the mommies also joined and assisted their kids, which, I believe, made their experience even better. I spend most of my days at home and sometimes it seems impossible to find a way to reach out, connect and be of service to others on a much more personal level from where I am. But lately, I’m discovering that it’s really not. Every time I let my daughters’ friends join in an art session on our dining table or each time I go downstairs to the lobby and hang out with another tired, chored-out Mom, somehow, I am being useful to the community. And for that I am very grateful. Special thanks to Tina Espenilla, Senior Brand Specialist of DMCI Homes Marketing Department for making this art class happen and for allowing me to play a role in it. This event was also featured in the DMCI Communities Website. Read write-up here.